This is one of incubators that we have at our clinic. 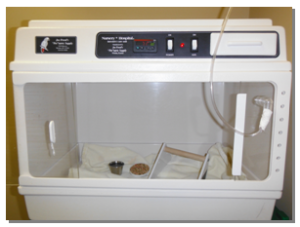 The incubator allows for us to provide humidified oxygen and medication when required. It also functions to increase the ambient temperature. These are a few things that can be done to help stabilize your pet bird upon their arrival. Depending on the type of emergency, your bird will be assessed and triaged. Some birds will require stabilization, which may include incubator support where we can provide a warmer environment with humidified oxygen. Once examined, we will discuss next steps with you. When you arrive at the clinic your pet will be triaged to assess the severity of his/her medical condition. This ensures that we address our most critical patients first. We appreciate your patience and understanding with the triage system and can assure you that your pet will receive the same level of attention as a patient that may be placed ahead of you due to urgency of its condition.